I think the secret of life, is to just chip away at it. © Carol L. O'Connor and cluckeyo.com, 2015-2017. Unauthorized use and/or duplication of this material without express and written permission from this site’s author and/or owner is strictly prohibited. Excerpts and links may be used, provided that full and clear credit is given to Carol L. O'Connor and cluckeyo.com with appropriate and specific direction to the original content. Another thing Glenn really wanted to do when he first moved here, was to fix up the yard. One day he was walking around the property and he found some half-whiskey barrels back behind the building. They were quite old, but still serviceable. There were 7 in all. Mom had once planted them with roses, but no longer used them. They were just laying around, so he loaded them on the truck and brought them to our yard. The first year, we planted marigolds and zinnias, and arranged them kind of in the middle of the yard. And each year, we tried something a little different. We tried petunias and even poppys. On the third year, we decided to line them up in a row on the edge of our yard, bordering the road. They looked really nice like that and though we have replaced them with new ones and added four more to the number, we have kept them in that same general configuration, ever since. 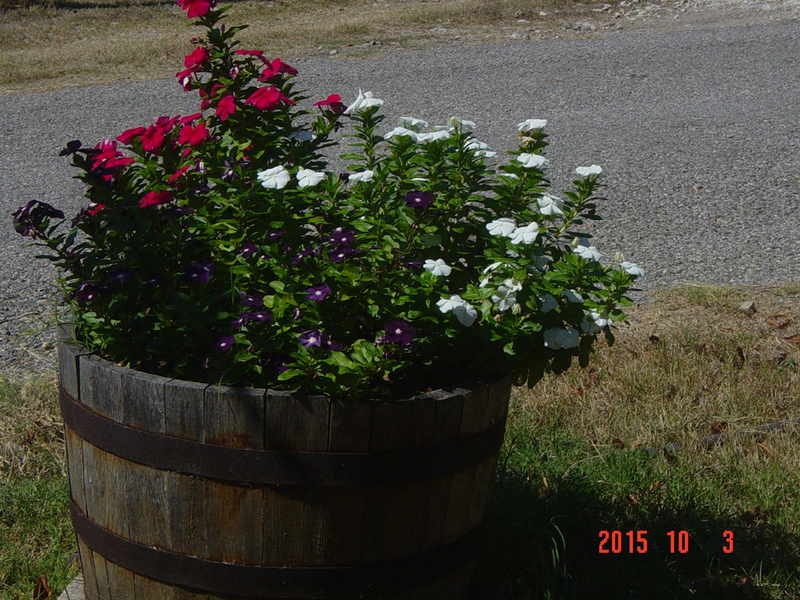 The flower we have had the greatest success growing in these barrels, has been the periwinkle (scientific name – Vinca). These flowers are very well adapted to our Central Texas climate. They are beautiful, prolific bloomers that begin in late spring and finally slow down with the first cool spells of late fall. They thrive in the extreme heat, just be sure they get their water. It has been an ongoing experiment, figuring out how to best care for these whiskey barrels. They need to be kept moist to ensure a long life. The first ones were over 20 years old and after a winter dry spell, they fell all to pieces. But in other years, we have lost our flowers due to poor drainage. Last year, we began addressing the drainage problems. We lifted the heavy barrels with a log and an iron pipe and placed 5 retaining wall bricks under each one. This reduced the problem, but did not eliminate it. This year, we filled them half-way with rocks, but that has not been very desirable. The soil sometimes washes through the rocks and when that happens, the water runs off. To remedy this, we filled the washed out areas with peat moss, which stabilized things. We have also used pea gravel. The next time we do this, we will fill the bottom half of the barrels with sphagnum moss. This would keep them moist and there would be no wash outs. And I think we would still have good drainage. Despite our difficulties, the barrels did really well this year, the best they have ever done. Those rocks provide excellent drainage. We used a soil mix of half sandy loam and half mushroom compost. 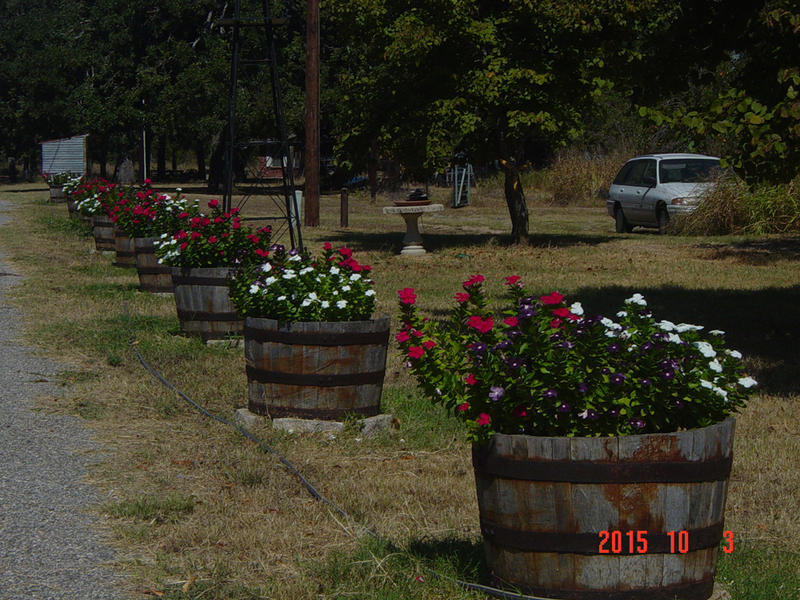 And they billowed over the sides of the barrels with vibrant color. Not a single barrel was lost all season. Watering these barrels on a regular basis has also been an experiment over time. After all, there are 11 of them and they sit up off the ground. This year I used 3 – 50 ft. sections of hose. I began with a leader hose that was fitted with a solid brass quick connect. And I placed the same quick connects between each 50 ft. section and at the end of the furthest one. This kept me from having to drag heavy hoses. I used a tiny little sprinkler with a quick connect on the end and would just disconnect the hose and place the sprinkler along as needed. I would start watering on the south end one time, and the the next time I watered, I would start at the north end, which saved me lots of steps. And I left the hoses on the ground and wrapped the ends around the furthest barrels when finished. It worked quite well. I used very low water pressure and watered each barrel between 5 – 8 minutes, depending on how hot it was outside. Barrels full of periwinkles have become a tradition at our home. They are so, very beautiful! When I walk down to Mom and Dad’s house, I don’t take the shortcut through the grass during periwinkle season, I go out on the road and enjoy my flowers!